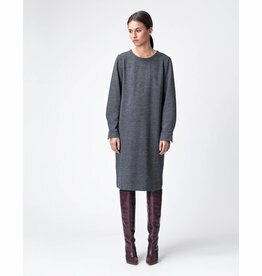 Cashmere cotton blend jersey dress with cowl neck, long sleeves and elastic waist. Ideal dress for all occassions. 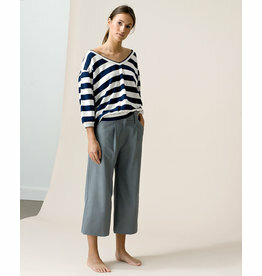 Sits above the knee, model wears a size 36. Straight cashmere cotton blend jersey dress with front slit, round neckline, 3/4 sleeves and a straight hem with side slits. Ideal dress for all occassions. Sits above the knee, model wears a size 36. Petrol jersey top with front slit, round neckline and short sleeves. Model wears a size 36. 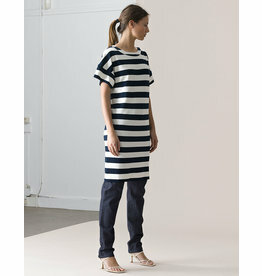 Straight jersey petrol dress with front slit, round neckline, short sleeves and a straight hem with side slits. Sits above the knee, model wears a size 36.